"Turn the classroom out-of-doors, put the students into motion, and force both students and teachers to come to grips with the healing power of direct experience." 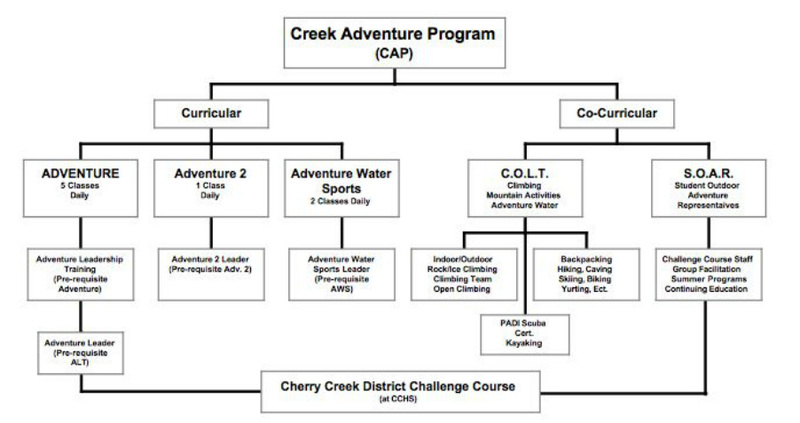 The Creek Adventure Program (CAP) is a well designed blend of curricular classes, complemented by unique after school and co-curricular clubs. Creek Outdoor Leadership Training (C.O.L.T.) Club and Student Outdoor Adventure Representatives (S.O.A.R.) offer students the opportunity to learn and experience through intentionally planned outdoor and challenge course related events. Our curricular classes are designed to fuel co-curricular opportunities and real-world leadership experience. The Creek Adventure Programs consists of ten daily curricular classes and multiple after school and weekend co-curricular opportunities for students and adults. A refined, quality structure positively influences self-concept, leadership skills, critical thinking and positive social skills. Since 1988, the program has been recognized nationally as a premier Experiential Education-based program focusing on peer leadership through adventure and outdoor education. It is the peer leadership aspect that makes the program ground breaking education. In basic terms, our high school students have taken a sequence of classes and trainings that allow them to re-enter level one and two classes as the instructor. These Leaders are the teachers and facilitators of their peers. They design and evaluate curriculum; adapt curriculum to meet the needs of a variety of students; facilitate academic and personal growth; manage inter and intra-personal skills; provide academic and peer counseling; and role model higher level thinking.